This cheesy and savory autumn harvest pizza with butternut squash, arugula, gruyere, and mushrooms is an autumnal meatless meal that will satisfy even meat lovers! 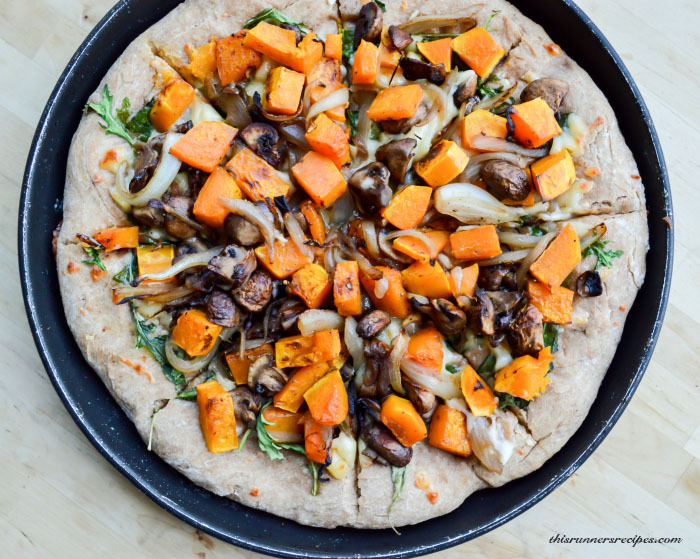 With a 100% whole wheat crust and lots of nutritious vegetables, this pizza is a healthy addition to your fall menu. First off, thank you so much for your kind and supportive comments over the past few days! I’m getting excited to run the marathon and visit Portland, although my stomach is feeling the anxiety of my first 26.2. That’s why we eat bland in the last few days before a marathon, right? This recipe is nothing but bland! Rather, it is the perfect meatless fall dinner. 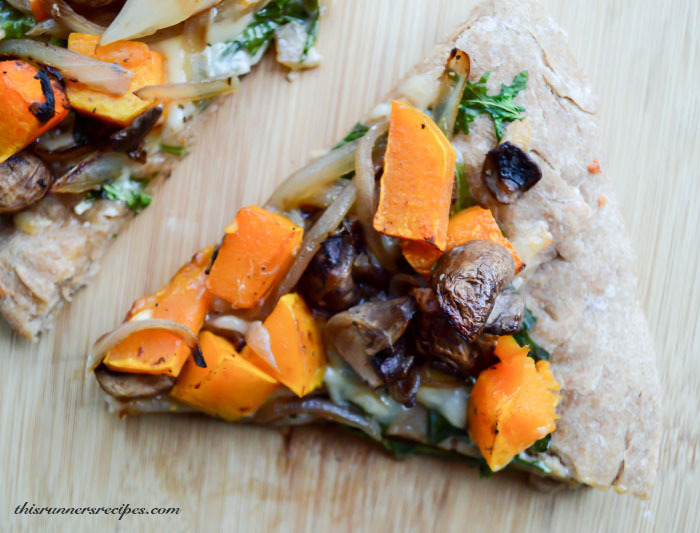 This autumn harvest pizza with butternut squash is loaded with creamy Gruyere cheese, fibrous and nutritious butternut squash, peppery arugula, and meaty mushrooms on top of a 100% whole wheat crust. Writing this post makes me want this pizza again. It’s so incredibly delicious, I could eat it once a week until our butternut squash supply runs out. Which, at the rate I keep buying them, will probably be in June. We savored this autumn harvest pizza twice last week, including after our 8 mile hike at Annette Lake last weekend. But whether you’re running a marathon or indulging in a Netflix marathon (Supernatural season 10, anyone? ), you’ll want to try this delicious autumnal pizza. Yes, this is yet another squash recipe, but it is also a hearty and delicious meatless meal that will satisfy even meat-lovers. 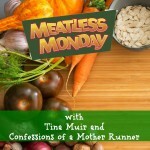 Sometimes meatless meals can be boring or just a bit unsatisfying – and I say that as someone who eats meatless for over 50% of the week. Don’t get me wrong: I do enjoy beans and rice, but sometimes I just crave that meaty flavor. Mushrooms are the perfect compromise between those cravings and a meatless meal. They provide that savory and meaty flavor, umami, that will please your family during meatless Monday or Fridays in Lent. Umami is a pleasant savory flavor that is found in foods high in glutamate. Thanks to glutamate, many protein-rich foods such as beef and pork offer a distinct umami flavor. Thus, when you use mushrooms in a meatless meal, you still get that rich, savory, satisfying meaty flavor. Umami flavor is particularly potent in meals where you combine beef, pork, or mushrooms with cheese, such as in a cheeseburger, pasta with meat sauce and parmesan, or this autumn harvest pizza. The Gruyere, mushrooms, and onions create a rich umami flavor and provides the pizza with a meaty texture. 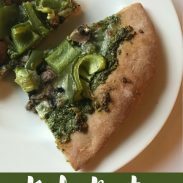 It’s not just the savory, meaty, earthy flavor of this pizza that will have seduce you into making it weekly; with just the right preparation, this autumn harvest pizza becomes an easy, hands-off meal that you can make from scratch on a busy schedule. The trick? The dough can be left to rise for 8-12 hours in your fridge. 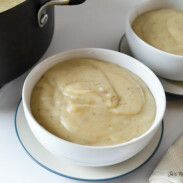 The dough itself requires only five minutes of preparation, so you can make it in the morning, pop it in the fridge, and then let it warm up and rise a bit more as you quickly preheat the oven and saute the vegetables. For even easier meal preparation, you can slice and dice your butternut squash ahead of time. 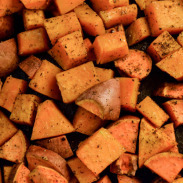 I like to peel and chop up my squash all at once, usually while making Sunday night dinner, so that it’s ready for easy prep throughout the week. If lactose gives you a problem, you can still enjoy this pizza! Gruyere is a low-lactose cheese, thanks to the aging and fermentation process. The autumn harvest pizza is actually brimming with gut-friendly prebiotics, thanks to the garlic, mushrooms, and onions, while the absence of acidic tomato sauce makes it gentler on sensitive stomachs. Which means that this pizza doesn’t just taste good—it’s good for you! Stir together the flour, vital wheat gluten, salt, and yeast. Add the oil and 1/2 cup of warm water and stir until a ragged dough forms. Knead on a clean surface or in the bowl for 2-3 minutes, adding 1 tablespoon of water at a time if needed. Grease the mixing bowl with olive oil, return the dough to the bowl, and cover with a towel Let rise in a warm area for 1-2 hours, or in the fridge for up to 12 hours. Season the onions, mushrooms, and butternut squash with salt and pepper. Saute in a pan (using oil or butter as needed) for 8-10 minutes, stirring frequently, until soft. Shred your cheese if needed. Roll out the dough into a pizza pan and spread the olive oil evenly across it. Sprinkle on the garlic and add the arugula on top of the crust. Top with the cheese and cooked vegetables. Bake for 10-12 minutes, until the crust is golden brown and the cheese is bubbly. Remove from the oven and let cool for 5-10 minutes before serving. *The vital wheat gluten is optional, but it adds a desirable thickness chewiness to the whole wheat crust. If pizza isn’t your thing, check out other meatless recipes as I link up with Tina and Deb for Meatless Monday! What are your favorite unusual pizza toppings? —> I once put asparagus on a pizza and it was amazing. What fall TV shows are you excited for?—> Dr. Who already started, Supernatural starts next week, and Grimm this month! I love homemade pizza! My favorite toppings are grilled chicken, spinach, and broccoli, but I also like just cheese sometimes. Looks delicious! Thank you, Lisa! Broccoli on pizza is so surprisingly good! 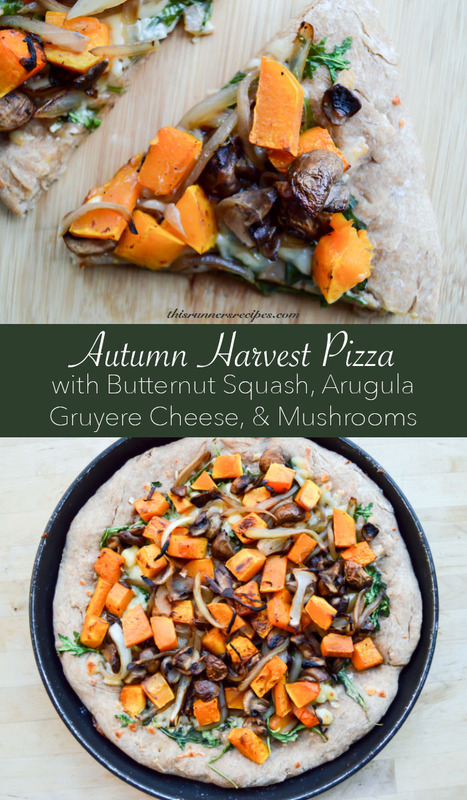 I have an autumn harvest pizza on my site but it is from ages ago–it has bnut squash on it too. I think everything is fair game in love and pizza. Good luck this weekend! Thinking 8:00 mile thoughts for you! Butternut on allll the pizzas, I would say! Thank you so much, Susie! Laura, this has been pinned to my board! My most favorite kind of pizza is wheat crust and anything healthy on top is perfect. I am not a meat eater, so all this is perfect. Congrats and good luck on your first full marathon. 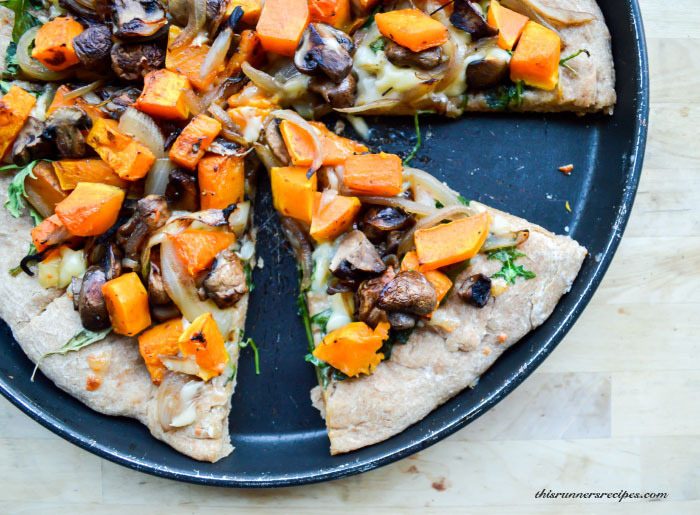 Butternut squash on pizza sounds heavenly! So excited for you this weekend! Laura, you are really, really gifted at this food blog thing. Your pictures are beautiful, the food looks incredible, and honestly, you’re just so inspiring. You should open a restaraunt. I will be thinking of you tomorrow when I am running! Wishing you the best of luck! I know you will do amazing! Love this pizza recipe, just love. Thank you, Meredith! I’ll be thinking of you and your race tomorrow – best of luck to you! I just saw an article on the Atlantic that Joaquin may not hit land, so hopefully you have good weather! Thank you! It tastes just as amazing as it looks, so I hope you enjoy it if you make it! I’ve never used wheat gluten before. I need to check that out. This looks amazing and right up my alley for sure. Thanks for linking up with us today! Thank you for hosting! I hope you enjoy the recipe before! I used the Bob’s Red Mill Vital Wheat Gluten, which I got off Amazon – it’s supposed to help making fluffy homemade whole wheat/rye/spelt breads.